What is your favorite piece of Thos. Moser furniture? I love the Lolling Chair, I have one at home and I just love it. What do you like most about working at Thos. Moser? I feel very fortunate to have had the opportunity to grow here and to learn many new skills. For Carol, personal development and self-improvement is always ongoing. She came to Thos. Moser years ago in search of something new and different. 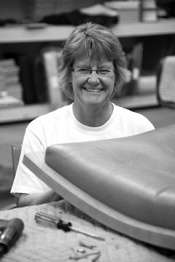 She began her career hand sanding before moving on to upholstery, where she is now the Coordinator of all upholstery projects. Carol is a hardworking, direct, and caring and she enjoys being a light for other people, including those who work with her. Her greatest accomplishment in life is maintaining a close relationship with her children and grandchildren. A typical weekend with her grandkids may include trips to the beach for swimming and a picnic, tie dying and other crafts.